Sub-ohm Box Mods Discussed: iStick 30, Innokin Cool Fire IV, Kanger Subox - all at SmokTek! Looking for a Mod to take your Vaping to the Next Level? For many vapers, the switch from eGo batteries to their first advanced device, like a Variable Voltage/Wattage mod, can be a bit daunting. You may be discouraged by the size and shape of a mod, or exasperated by the extra buttons and the bright OLED screen, with its cryptic information. However, a more advanced VV/VW mod can open up a whole new world of vaping to you. These Mods are more powerful and longer lasting than eGo batteries; depending on how much you vape, it could be days before you need to charge your mod. They are intelligent and display all essential information at a glance – atomizer resistance, volt and watt output, remaining battery life. With a wide range of power at your fingertips, you can adjust power output to match a much wider variety of atomizers and coil resistances, all the while using the same device. In a nut shell, a VV/VW mod will allow you to play around with different atomizers, and experience various styles of vaping using the same mod. We have compiled a short list of the newest, smallest and most user friendly mods to take your vaping to the next level. These devices are a great investment, because no matter where you are in your vaping journey, they can see you through to the next stage. They can handle any type of atomizer you throw at them, from regular clearomizers and cartomizer tanks, to sub ohm clearomizers, or rebuildable atomizers. These mods not only have a great range and awesome features, they are small; you don’t have to feel self-conscious carrying one of these little guys around. And, don’t be intimidated by the extra buttons and OLED screens; these mods are very easy to use. Keep reading to find your match! 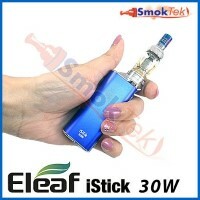 At just below 3 inches in height and under an inch in width, the Eleaf iStick 30W is the smallest device on our list. But don’t let its diminutive size fool you. This teeny tiny mod is a perennial favorite amongst vapers for a reason. The Eleaf iStick 30W has a long lasting 2200mAh internal Li-Ion battery, easy to read screen, a spring-loaded 510 connection (to ensure your atomizers fit flush), and allows you to adjust wattage between 5.0-30.0W and voltage between 2.0-8.0V. You can also use it as a Pass-through device, meaning you can keep on chucking clouds while you charge! Pair the iStick 30W with everything from your Innokin iClear 16 clearomizers to an Aspire Atlantis sub ohm tank, or even a Veritas RDA. This little beast can handle coil resistances anywhere between 0.4 ohm up to 5.0 ohm. Pick up just the mod or a full kit (includes chargers and an eGo adapter.) If you like the iStick series, but want more power and an even longer lasting battery, make sure to check out the iStick 30W’s big brother, the Eleaf iStick 50W. Innokin is a highly regarded manufacturer in the vape world: with a commitment to user safety, a solid reputation for innovative designs and excellent build quality, it is easy to see why. 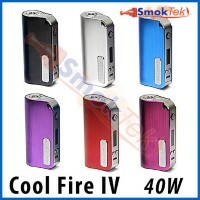 The Cool Fire IV screams style and quality. Not only does it look and feel great, it has some pretty fantastic features as well. The Cool Fire IV comes with several kinds of protection and can be used as a Pass-Through. This mod is unique with its extra ON/OFF button on the bottom of the device, which helps eliminate any residual current drain from the high capacity 2000mAh internal Li-Ion battery. The mod lets you adjust wattage between 6.0-40.0W and voltage between 3.0-7.5V. Its spring-loaded 510 connection makes sure your iClear 30S or Aspire Nautilus clearomizers sit flush on the device. The Cool Fire IV can comfortably handle any sub ohm atomizer, like the Smok VCT X2, with coil resistances all the way down to 0.2 ohm. Pick up a Cool Fire IV here. Each mod comes with a Micro USB charge cable and an eGo adapter, for all your eGo threaded atomizers, like the Kanger Mini ProTank-3. The Kanger SUBOX Mini Kit is one of the most versatile, all-inclusive kits we have seen to date. Available in either black or white, this kit consists of a KBOX Mini mod and Kanger’s now famous Subtank Mini hybrid clearomizer. The KBOX Mini mod is the only one on our list which allows for a user-replaceable battery. If you are the kind of vaper who likes to pop in an already-charged battery when battery power runs low, instead of waiting for the unit to charge up between uses, this is the mod for you. The KBOX Mini lets you adjust wattage only, between 7.0-50.0W, and it goes without saying that it works great and looks stunning with the included Subtank Mini. The Subtank Mini clearomizer comes with a 1.5 ohm coil and a 0.5 sub ohm coil. If you have been curious about sub ohm vaping, this clearomizer is a great way to try it. In addition, the kit includes a Mini RBA Plus base, which is a great beginner’s introduction to rebuildable atomizers. Although it matches perfectly with the included Subtank Mini clearomizer, the KBOX Mini mod can keep up with a wide variety of atomizers with coil resistances between 0.3 ohm and 1.6 ohm – everything from an iSmoka Mega BCC clearomizer to a Kayfun Lite Plus. And, the Subtank Mini clearomizer will work on many other mods, including the Eleaf iStick 30W and Innokin Cool Fire IV. Pick up your own SUBOX Mini Kit in Black or White. Each kit comes with everything needed to get you started, save for a High Drain battery and e-liquid. Interested in the KBOX Mini mod only? It will soon be available at SmokTek, so keep an eye out for it in coming weeks! !